"You have a real weapon and you choose not to use it." Though he's better known for his sense of humor covering the week's headlines in politics and world affairs, comedian Jon Stewart is getting deadly serious with his directorial debut, a drama called Rosewater. 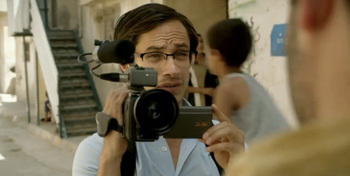 In the film Gael Garcia Bernal plays journalist Maziar Bahari, a Tehran born man who returned to Iran in 2009 to interview Mir-Hossein Mousavi, who was the challenger to president Mahmoud Ahmadinejad. But following his shooting coverage of the protests after Ahmadinejad's victory before the polls even closed, Bahari was arrested by police, tortured and interrogated for 118 days as a spy. Now the trailer has arrived and it looks powerful and superb. Watch now! See the first poster for the film premiering at Telluride and TIFF right here. In 2009, Iranian Canadian journalist Maziar Bahari was covering Iran's volatile elections for Newsweek. One of the few reporters living there with access to US media, he also appeared on The Daily Show with Jon Stewart, in a taped interview with comedian Jason Jones. The interview was intended as satire, but if the Tehran authorities got the joke they didn't like it — and that bit of comedy would come back to haunt Bahari when he was rousted from his family home and thrown into prison. Rosewater, written and directed by Jon Stewart, will premiere at Telluride & TIFF. Open Road Films will release the film November 7th this fall. Oh man. Stewart has what it takes. This looks phenomenal for a directorial debut. Hopefully this well-crafted trailer will equal a well crafted film. Looks good. Looks way happier than I thought it would.